Sciblogs | What’s With Those Aftershocks?! At 7:49 am this morning, Christchurch and western Banks Peninsula were hammered by a particularly vicious aftershock. 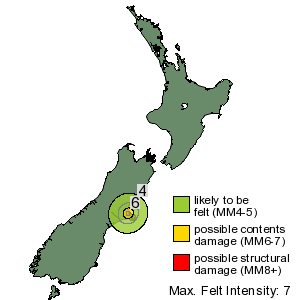 This latest tremor had a magnitude of ‘only’ 5.1, but was centered just a few kilometers from Christchurch, at a very shallow depth of only 6km. As can be seen from the Geonet mapping, the ground shaking intensity from this aftershock would have reached up MM 7 near Christchurch. The short but intense tremor lasted about 10 seconds, but the ground shaking was violent enough to cause more damage (at least to our home), than Saturday’s magnitude 7.1 quake. We had just had the brick chimney and firewall inspected, and deemed sound, yesterday. Both are now in ruin! when will these aftershocks diminish? why was this powerful aftershock centered well away from Saturday’s mainshock? was it another earthquake on a different fault? 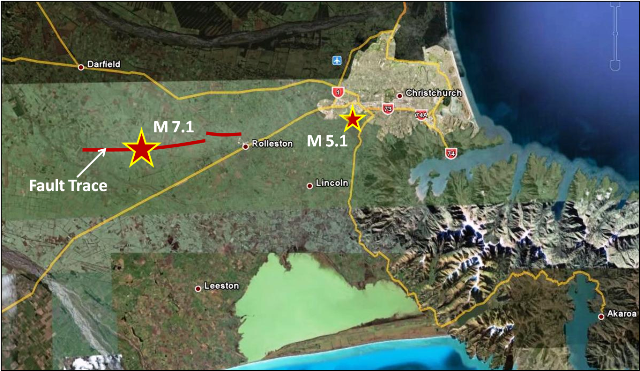 Dr. Mark Quigley, professor in Geological Sciences at Canterbury University, and one of the lead investigators on the ongoing assessment of the fault has a concise summary of the geology behind the Canterbury aftershocks on his website. An important point is that aftershocks are caused by slippage on parts of the fault that did not rupture with the main earthquake, or in areas near (but not on) the fault, where the surrounding geology continues to adjust to the recent movements within the earths’ crust. During earthquakes, including large ones, it is common for sections of a fault to rupture, rather than the entire length of the fault. Such piecemeal release of stress can transfer strain to other sections of the fault, or other faults. The sharp jolt felt this morning was likely caused by strain release related to Saturdays large earthquake, but not necessarily on the same fault. This sharp aftershock was short in duration compared to Saturdays’ event, probably because there was less strain available to release, and less associated ground movement. The Canterbury aftershocks should be taken as a positive sign, as each aftershock is releasing more built-up strain along and nearby the fault. Although undoubtedly frightening, these aftershocks will, in general, gradually diminish in frequency and severity during the upcoming days and weeks. We must remain vigilant though, as it is highly likely that we will experience at least one more shaking event around magnitude 6, as the earth continues to adjust to this large event. This is really interesting, Jesse. I’m learning a great deal from your posts. Thank you.